The Bourne Deeping Ladies second team that enjoyed an unbeaten East League season. City won their final East Conference fixture 2-1 at arch-rivals Cambridge City last weekend, but a draw between top six rivals Brighton and Teddington meant the city side finished seventh on goal difference. City of Peterborough Ladies seconds (red) in action. But promotion to Division One of a restructured National League is still possible. City need to finish in the top two of a three-way play-off battle against Preston of the North Conference and Fareham of the West Conference. That battle starts on Sunday (April 7) when Fareham host Preston. Fareham will visit Bretton Gate on April 13 (noon start). That date is also taken up by the annual Roger Brummitt Mixed Hockey tournament so a big crowd is guaranteed. City finish at Preston on April 28, 24 hours after they host Bowden in the English KO Cup semi-final. There was no disgrace in City’s seventh placed finish as they were adrift at the bottom a month ago. 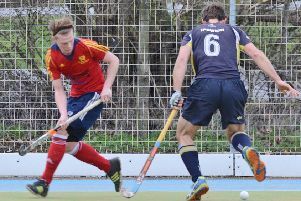 Three wins - including one against second-placed Oxted - and a draw against champions Old Georgians in their final four matches shot them up the table. City of Peterborough Ladies seconds will play in East Division One next season for the first time in the club’s history. They deserve it as well having dominated Division Two North West from the get-go. City made it 21 wins from 22 unbeaten matches with a 7-1 hammering of Pelicans in their final outing as Rosie Bond and Holly Finding both cracked hat-tricks. Hope Elkins completed the scoring for a team who finished with 89 goals scored and a goal difference of +81. City were equally strong defensively conceding just eight goals all season. Goalkeeper Ellis Srnska kept 16 clean sheets. Ed Whybrow finished the season in style for City fourths with a douhle hat-trick in their final Division Four North West game at Leadenham. Libby Smith scored the other goal in a 7-2 romp. City finished third and just missed out on promotion. Goalkeeper Karen Wilson kept 10 clean sheets. Bourne Deeping seconds claimed the Division Three North West crown without losing a match. They won 19 of 20 matches. Champions Long Sutton seconds and Spalding thirds filled the top two spots in the men’s Division Four North West table. Spalding finished two places and eight points ahead of their own second team!